Mendeleevite-(Nd): Mineral information, data and localities. 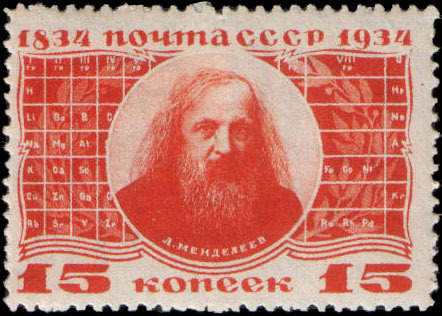 To honor Dmitri Mendeleev (1834–1907), famous Russian chemist, author of the periodic table and Nd. The Nd-analogue of mendeleevite-(Ce). Unique combination of elements; the first Cs-Nd mineral. Agakhanov, A.A., Pautov, L.A., Sokolova, E., Hawthorne, F.C., Karpenko, V.Y., Siidra, O.I. and Garanin, V.K. (2015) Mendeleevite-(Nd), IMA 2015-031. CNMNC Newsletter No. 26, August 2015, page 945; Mineralogical Magazine, 79, 941-947. Agakhanov, A.A., Pautov, L.A., Sokolova, E., Hawthorne, F.C., Karpenko, V.Yu., Siidra, O.I., Garanin, V.K. (2017): Mendeleevite-(Nd), (Cs,□)6(□,Cs)6(□,K)6(REE,Ca)30(Si70O175)(OH,H2O,F)35, a new mineral from the Darai-Pioz alkaline massif, Tajikistan. Mineralogical Magazine: 81: 135–141. Agakhanov, A.A., Pautov, L.A., Sokolova, E., Hawthorne, F.C., Karpenko, V.Y., Siidra, O.I. and Garanin, V.K. (2015) Mendeleevite-(Nd), IMA 2015-031. CNMNC Newsletter No. 26, August 2015, page 945; Mineralogical Magazine, 79, 941-947; Agakhanov, A.A., Pautov, L.A., Sokolova, E., Hawthorne, F.C., Karpenko, V.Yu., Siidra, O.I., Garanin, V.K. (2017): Mendeleevite-(Nd), (Cs,□)6(□,Cs)6(□,K)6(REE,Ca)30(Si70O175)(OH,H2O,F)35, a new mineral from the Darai-Pioz alkaline massif, Tajikistan. Mineralogical Magazine: 81: 135–141.